I was clued in to this Chicago band from my good friend @swamipat. He's the mayor of Chicago as far as I'm concerned and he's brought a few really great bands to my attention. I hope that I've returned the favor for him at least a couple of times. 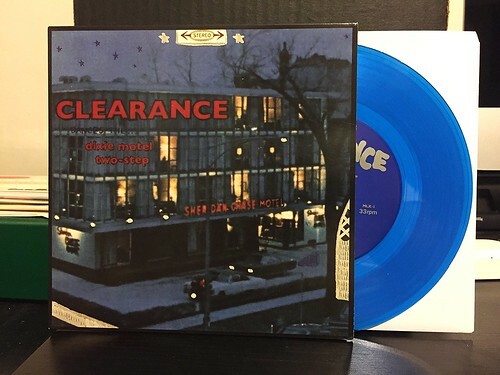 Clearance is another stellar recommendation from Pat. It would probably be physically impossible to write a review of Clearance without mentioning Pavement. Pavement is so obviously a major, major influence for Clearance and it really shines through on the four songs crammed on to this 7". If you're going to wear influence like this on your sleeve the way Clearance does, Pavement is a pretty good band to be inspired by. While they're absolutely not a carbon copy, they take me to that same place when I listen to this record. Breezy, mid tempo pop that comes across so completely natural and effortless. I'm sure this band works and practices just as hard as any other band, but they have this disarming ability to sound like they just happened to be wandering by a recording studio and spat out four nearly perfect songs on a whim. They're relaxed without delving into psych tinged nonsense. Catchy without succumbing to the obvious hook and intelligent without making you feel stupid. It's a marvelous balancing act and my biggest regret is that this 7" has been floating around for 2 years and I wasn't listening to it already. Luckily I'm on board now and there's more Clearance coming in the future. Highest possible recommendation if you're a sucker for 90's indie rock like I am.